Early last month, while walking the dog, the LDS missionaries on their bikes came up behind me. One from MD and one from HI. I had a great, cordial 30 minute or so conversation with them. I said a quick prayer for them, and left them with my site JosephLied.com. They asked for my address to talk more, but as expected, they never came. One had heard of my site before. He said they got it on a card in Magna a while ago. This guy understood and had heard of some of the problems I was bringing up, but God gave him direct revelation Mormonism was true, so he doesn’t have to really worry about them. Interesting that we had a discussion of racism not long before the Charlottesville blow up. I told them that their own Book of Mormon is clearly white supremacist literature. One of the missionaries responded with the typical 2 Nephi 26:33: "For none of these iniquities come of the Lord; for he doeth that which is good among the children of men; and he doeth nothing save it be plain unto the children of men; and he inviteth them all to come unto him and partake of his goodness; and he denieth none that come unto him, black and white, bond and free, male and female; and he remembereth the heathen; and all are alike unto God, both Jew and Gentile." But of course this only gives half the story! The other half is that the Book of Mormon clearly teaches that God, even though He says all are alike in having the opportunity to come to Christ, still curses people with dark skin (Alma 3:6 and 2 Ne. 5:21), and as they repent, their curse of dark skin is taken from them and they get white skin (3 Ne. 2:14-16). After Charlottesville, the LDS Church hypocritically quoted their past president Gordon B. Hinckley saying, "No man who makes disparaging remarks concerning those of another race can consider himself a true disciple of Christ." Social media has gone crazy over the LDS Church’s response! We had a couple sister missionaries (Jennifer Cooke and Yolanda Bradford) from Washington stay with us. They were actually Christian missionaries that are burdened for Mormons to know the God of the Bible! They evangelized and did prayer walks first in Orange County, CA and then here. 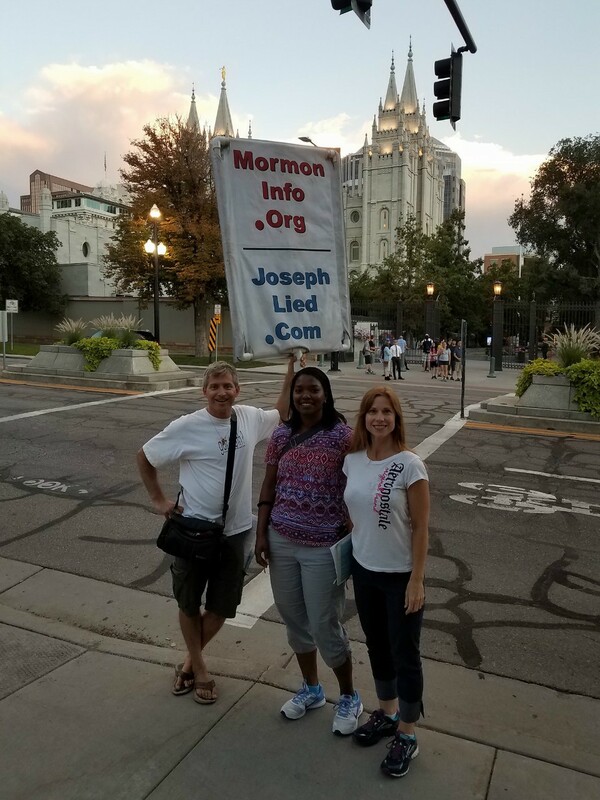 I took them to Temple Square one night and we had a great night witnessing! While I was challenging the hard heads coming in and out of the temple, they were in front of the North gate with a team of Christians that meets there every week, weather permitting. 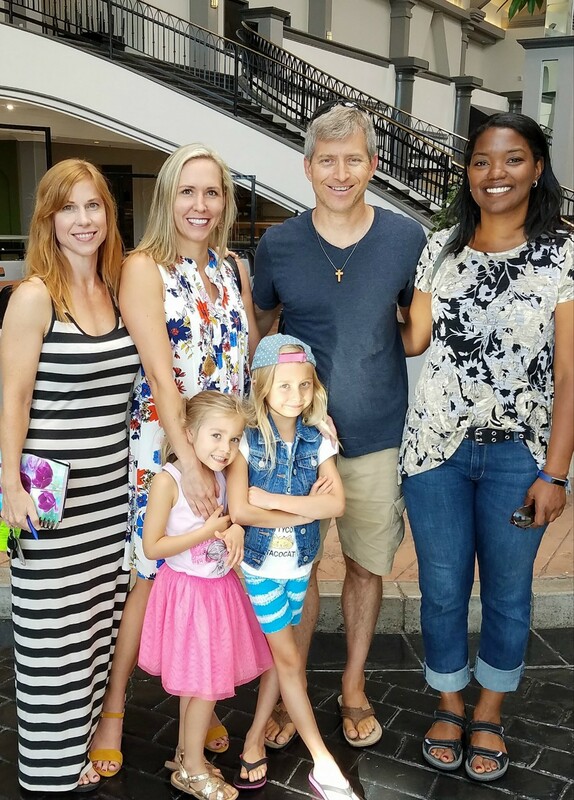 Jennifer and Yolanda got to lead a student at the University of Utah to the Lord! His name is Jeremiah. He had a Christian upbringing, but never became born-again. He joined the LDS Church a couple years ago, but repented of it that night! At our monthly fellowship, Jennifer and Yolanda shared about their mission. You can watch their brief presentation here. We also had a wild testimony from Norm Dunham, which you may watch here. If you’d like to see pictures of the event, click here. Great signposting guys and I wish I was there with you, awesome spots to take up with your JW.info.org, looking forward to reading your news letter fully thank you. Hello… I am 64 years old and very confused. [I replied:] Thanks for your email and for signing up for the class at MormonInfo.org. I think my other site will be helpful for you as well. Please check out JWinfo.org. I think Jesus is the way, the Truth, and life and He alone has the words of life (Jn. 6:68 & 14:6). Rest for your soul will be found only in Him. Make Him your ultimate. Like Thomas, make Him your Jehovah (Jn. 20:28). All other God's are false or idols. He, along with the Father and Spirit, created everything from the beginning (Ps. 96:4-5, Gen. 1:2, Isa. 44:24, Jn. 1:1-3, 14). I encourage you to trust Him, and read His word from some standard translation, and feed off it. I pray that God will protect you from the enemy who wants to destroy you. Jesus did not exist before he was conceived! [I replied:] Sure, as Jesus. However, Jesus as the Son of God or God the Son certainly did and as such created all things from the beginning (Jn. 1:1-3, 14; Rom. 9:5; and Col. 1:13-18). [He replied:] John 1:13 wipes out all that at the time jesus was flesh it says flesh is not god. 1:14 mistranslates two words gonomahi and kia simply change became to made and the word and to which. The word made flesh which dwelt amoung us. As the only begotten. Acts 13:33 is clear he was begotten at his resurection. Same as romans 1:4 and rev. 1:5. John 1:13 speaks of the word wich is god raiseing the dead and verse 14 is refering to that dead being jesus who they seen raised or begotten. All things from pas is refering to context. I went to the garage sale and bought all things or everything. It never refers to everything in existance. The word also means everyone. You have to point to something in context when refering to pas as all things or everything or everyone. Is paul speaking about the church in context? [I replied:] Isa. 44:24 says that the Lord creates all things *by Himself. * He does it "alone." If Jesus was involved in any creation, He's the Lord. Jesus is the "King of kings and Lord of Lords" (Rev. 19:16). So Jesus is above all other Lords. He is the one true Lord. All other Lords are false lords. You can only serve One master (Lk. 16:13). By definition, your Jesus is devalued. However, our Jesus is exalted above all else, since He is rightly put in the position the Bible describes Him as: "God over all, blessed forever" (Rom. 9:5). Jesus received "worship" (e.g., Mat. 28:16-20), and yet Jesus Himself taught that we were only to worship God (Mat. 4:10). The Greek in Jn. 1:18 is clear... He is the "only begotten God" ("monogenes theos"). This is the Word who was with God and was God from the beginning as verse 1 states. There is no "kia" in verse 14. Kia is a car. "Kai" is the Greek for "and." There is also no word "gonomahi" there. I'm looking at the Greek right now. I think you're referring to the word "begotten" there, but the term is "monogenes" which is the same word used in verse 18. This context is clear that Jesus has the nature of God, since like begets like. Since God is eternal and from the beginning, the beginner of the beginning, the Son must also be eternal, and thus He was begotten from eternity. None of us are sons in that sense. Now just because other contexts refer to other begettings (e.g., humanity or exaltation at the resurrection) of Jesus doesn't take away from the fact that the begetting here in John 1 refers to His divine nature. Christ is one Who with 2 whats--divine and human. Speaking of raising Jesus from the dead, God does that (Acts 5:30). Yet, Jesus promised to raise Himself from the dead in John 2:19-20. The Spirit also is said to have risen Jesus from the dead (Rom. 8:11). Obviously, the Spirit is God as well. There's only 1 true God (Jn. 17:3), but that God obviously is made up of more than 1 Person. The context of John 1 is from the "beginning" and at least 2 identities or persons are there before anything is made (vss. 1-3). You going to a garage sale obviously has a context of a certain period of time. For you to equate that with John 1 just shows how much you denigrate the creating scope of the Word who became flesh. Colossians 1 says He is before all things, creates all things, and in Him all things hold together. A friend just sent me this interesting 5 minute video you might find interesting in this regard: https://www.youtube.com/watch?v=QSR8z_0uW5E. The Father commands the angels to worship the Son of God and calls Him "God" (Heb. 1:6-8). As the Son, He is contrasted with the angels. He is the one through whom God created the universe (vs. 2). Jesus in Revelation comes in the clouds and says He is the "Alpha and Omega, the beginning and the ending, saith the Lord, which is, and which was, and which is to come, the Almighty" (1:8). "And when I saw him, I fell at his feet as dead. And he laid his right hand upon me, saying unto me, Fear not; I am the first and the last: I am he that liveth, and was dead; and, behold, I am alive for evermore" (1:17-18). Isaiah 44:6 says, "I am the first, and I am the last; and besides me there is no God." Again, Rev. 21 says, "I am the Alpha and Omega, the beginning and the end. I will give unto him that is athirst of the fountain of the water of life freely. He that overcometh shall inherit all things; and I will be his God, and he shall be my son" (6-7). Keep in mind John 4:14: "But whosover drinketh of the water that I shall give him shall never thirst; but the water that I shall give him shall be in him a well of water springing up into everlasting life." Rev. 22 says, "[T]he Lord God of the holy prophets sent his angel to show unto his servants the things which must shortly be done. Behold, I come quickly" (vss. 6-7). Verse 12 says, "I come quickly." Verse 13 says again, "I am Alpha and Omega, the beginning and the end, the first and the last." We just saw that 1:8 identifies this as the Almighty, yet 3 verses later it says, "I Jesus have sent mine angel to testify unto you these things in the churches." Verse 20 says, "He which testifieth these things saith, Surely I come quickly: Amen. Even so, come Lord Jesus." You need the God of the Bible; you need to accept Jesus as your God as well, or according to Him, you will die in your sin (Jn. 8:24 and 56). I pray that you repent for believing that Jesus is simply a prophet. He certainly was a prophet, but as such, you should listen to what He taught about Himself. [I replied:] Please read my site www.JosephLied.com. I hope it helps. [I replied:] Well you can always love something that is wrong and you need to give it up. [I replied:] I don't know if he's attacking you now or not, but I do know that he uses the LDS Church to lead people to hell. Remember what the Bible says: "There is a way that seems right to a man, but the end thereof is the way of death" (Prov. 14:12).